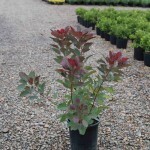 A large shrub, or small tree, with deep-blue green foliage. 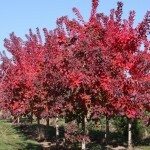 Leaves are bright red when young, and fall color is brilliant red, orange and yellow. The typical Smoketree pink flowers are held on a 14" x 11" panicle. It prefers full sun for best color and a well-drained soil. 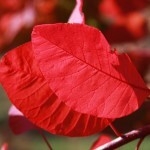 As with most Cotinus, it responds well to hard pruning. This is a hybrid of C. obovatus and C. coggygria.